The Asahel Curtis Nature Trail and Annette Lake Trail branch from side-by-side trailheads. On the left is the Asahel Curtis Nature Trail, a short loop trail that can be enjoyed on its own or as a worthwhile addition to a jaunt up to Annette Lake by the trail on the right. 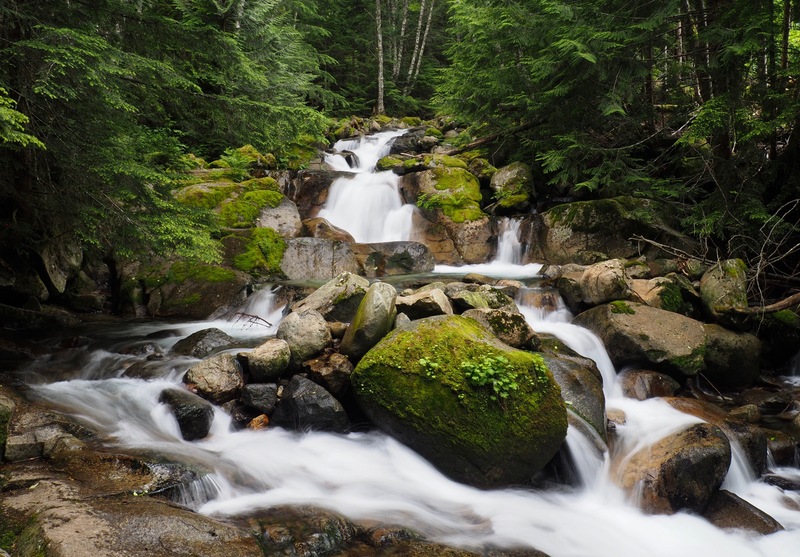 The Asahel Curtis Nature Trail loops through one of the last remaining pockets of old-growth woodland in the Snoqualmie River Valley and is named for Asahel Curtis, an early photographer of nature in Washington, Yukon, and Alaska. Its relatively flat tread ambles through lush, many-storied woodland ranging from ferns and orchids peeping from the forest shadows to lofty, old-growth giants draping their evergreen canopy over all. Pamphlets available at the trailhead provide a self-guided tour with descriptions of some of the trailside features that correspond to numbered posts along the path. Although not an ADA-accessible trail, the nature trail’s short distance and gentle grade offer a pleasant woodland experience to those who may not wish to undergo the rigors of a more strenuous hike. Just off of Interstate 90, the nature trail also provides a scenic break on a long drive (a privy is available at the nearby Asahel Curtis Picnic Area); however, the freeway whir is always within earshot. The rightward trail to Annette Lake climbs moderately along the slopes of Silver Peak through varied stands of dense, second-growth conifer forest laced with cheery rivulets. Along the way, glimpses of Humpback Mountain open to the west. The trail is also interrupted by the massive boulderfields that are Silver Peak’s winter and spring avalanche chutes — when snow is present, be sure to check avalanche reports before hiking this trail. The trail’s destination is a jewel-hued lake set beyond a heavy forest fringe that reaches to the very water’s edge. 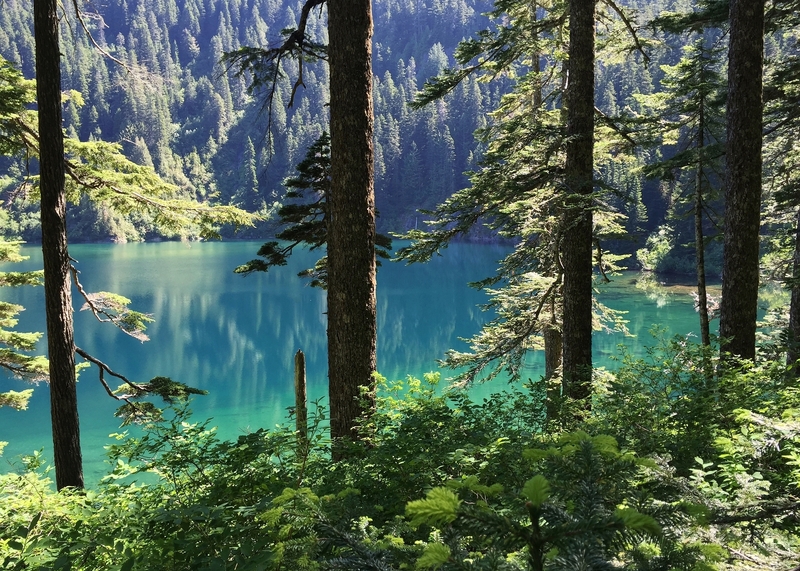 Beyond the trailhead, the rush of Interstate 90 is soon lost among the woodland folds, but do expect the company of other hikers, as Annette Lake is a popular hiking destination. Columns of old-growth conifers line the nature trail, which is borne across damp spots on sturdy boardwalks and bridges. Asahel Curtis Nature Trail, July 04, 2018. 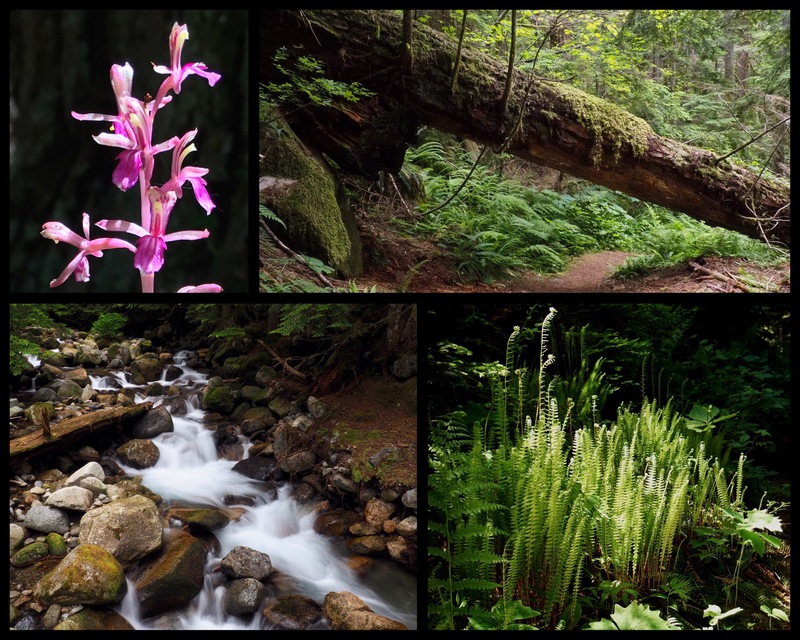 Set in the deep shade of Silver Peak’s northwestern slope, the woodland about the nature trail is nevertheless illuminated with dappled sunlight on summer afternoons, when Pacific, or, western coralroot orchids (Corallorhiza mertensiana) (upper left) and lush drifts of deer ferns (Blechnum spicant) (lower right) glow in sunbeams shifting across the forest floor. Humpback Creek rushes down from Annette Lake high above (lower left) and, halfway through the loop, the nature trail ducks beneath a nurse log, topped by seedlings of the forest’s next generation (upper right). Asahel Curtis Nature Trail, July 04, 2011, June 20, 2015, and July 04, 2018. The Annette Lake Trail climbs moderately through shadowy, mostly old-growth evergreen forest with varying degrees of understory foliage. Annette Lake Trail, July 04, 2010 and August 11, 2013. Near the trailhead, a bridge crosses Humpback Creek’s sometimes trickling, sometimes roaring waters. Annette Lake Trail, July 04, 2018. At approximately one mile/1.60 km, the trail crosses a swath cut into the forest for power lines. A short distance later, the forest again opens at the trail’s intersection with the broad Iron Horse Trail, which follows an old rail line across the state to Idaho. 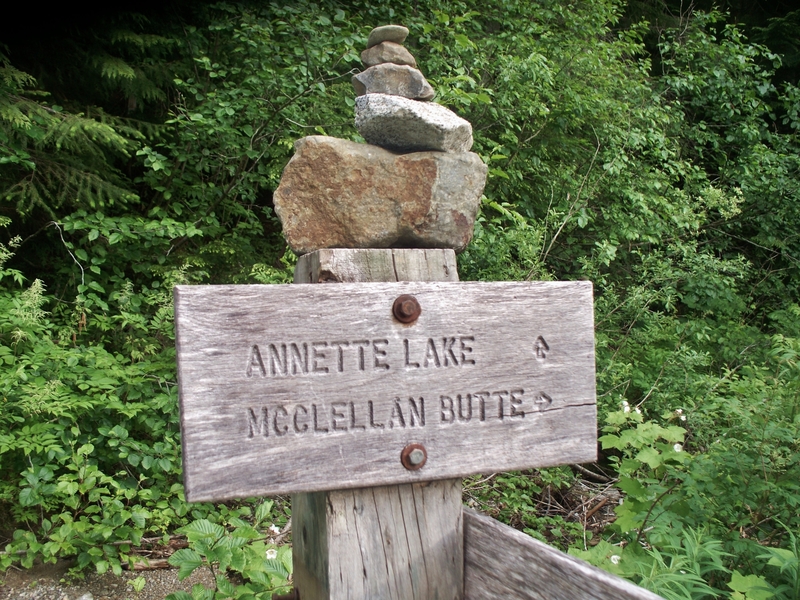 To rejoin the trail to Annette Lake, look for a wooden sign on the opposite side of the Iron Horse trail to locate the often overgrown forest entrance. Annette Lake Trail, July 04, 2010. 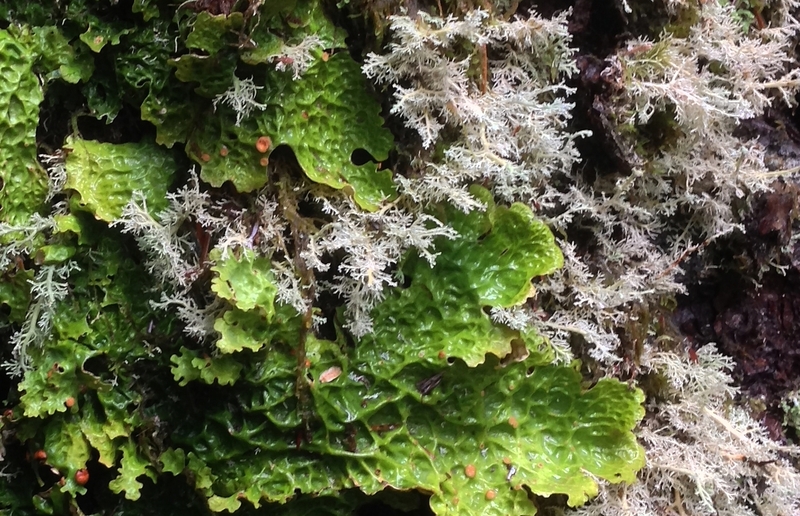 When winter rains return, lush mosaics of lichens (here, likely lettuce lichen, Lobaria oregana, and ball lichen, Spaerophorus sp.) revive along the trailside tree trunks. Annette Lake Trail, December 29, 2013. In the woodland wayside, keep an eye out for unusual wildflower species. Named for their glistening, sticky flowers that resemble drops of pitch from the conifers under which they grow, pinedrops (Pterospora andromedea) (left), possess little chlorophyll and live unseen off fungi in the soil until they sporadically sprout leafless flower stalks above their subterranean homes. The rattlesnake orchid (Goodyera oblongifolia) (right) is fancifully named for the snakeskin pattern that sometimes marks its leaves. Annette Lake Trail, August 11, 2013. 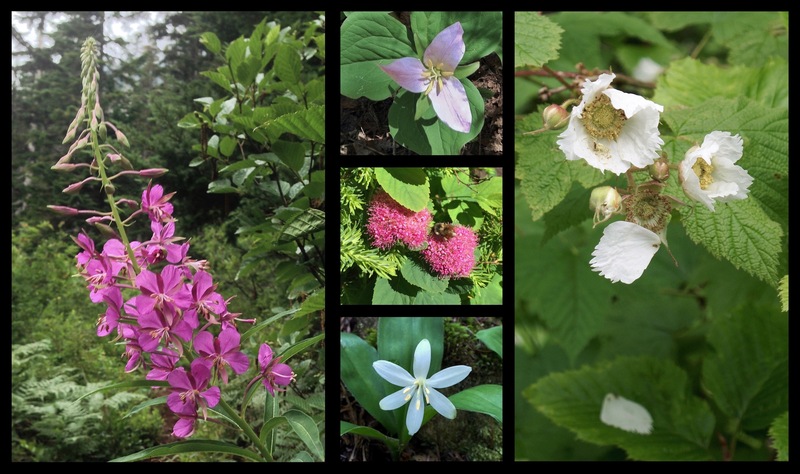 Other, more ordinary blooms also dot the forest, including lumbering spires of fireweed (Chamerion angustifolium) (left), delicately blushing Pacific trilliums (Trillium ovatum) (upper center), clove-scented subalpine spirea (Spiraea splendens) (center), elegantly nodding queen’s cups (Clintonia uniflora) (lower center), and shyly shedding thimbleberries (Rubus parviflorus) (right). 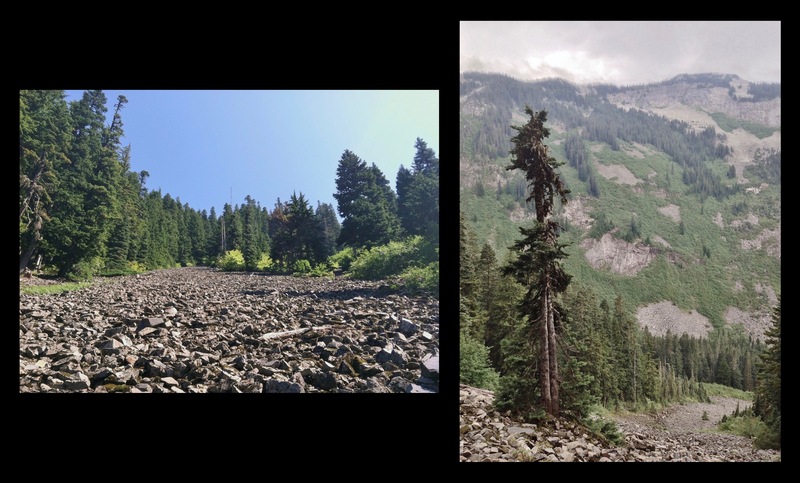 Annette Lake Trail, July 2010, 2011, and 2015 and August 2013. As the trail to Annette Lake climbs, occasional views open across Humpback Creek’s valley to Humpback Mountain beyond. (The mountain’s namesake “hump” is only visible from Lake Annette’s eastern end.) Annette Lake Trail, June 20, 2015. In winter and spring, avalanches sweep down several chutes on Silver Peak that extend from high above the trail and disappear from sight far below. Be sure to check avalanche forecasts before setting out or avoid the trail altogether while snow is present. Annette Lake Trail, August 12, 2012 and August 11, 2013. Upon reaching Annette Lake, Abiel Peak is first to greet the sight, rising above the lake’s southern shore. Snow often lingers into summer around the lake and surrounding peaks. Annette Lake, July 04, 2011. Annette Lake’s eastern shore offers an expansive view of Humpback Mountain — including its arched upper spine from which it derives its name. Annette Lake Trail, June 20, 2015. Silver Peak bounds Annette Lake’s eastern shore, its summit obscured beyond the curve of its steeply pitched slope. More readily heard than seen, a large waterfall dashes coyly down Silver Peak’s shaggy mountainside into the lake below. Annette Lake Trail, July 05, 2010 and June 20, 2015. From the slight elevation of the lake’s west end, the vivid turquoise hue of its waters is especially apparent. Annette Lake Trail, June 20, 2015.